Network DGNSS solution for maritime service providers. Pre-Broadcast Monitoring and Far Field Monitoring. DGPS corrections with integrity information about state of the satellite system. Converting GNSS raw data streams or log files to various standard output formats. Content analysis and verification of different GNSS real-time data streams. Processing, analysis and display of different measurements. Processing multiple GNSS reference stations in a networking mode. Ntrip Caster and mountpoint availability monitoring. BKG Professional NtripCaster web interface. Low-cost GNSS positioning and telemetry system. Low-cost L1 RTK GNSS receiver and mapping software for accurate field data collection. Technical support, development assistance for different projects. Run your Alberding applications on our servers. On the top side of the A07 you can find the power button and four LED status lamps. 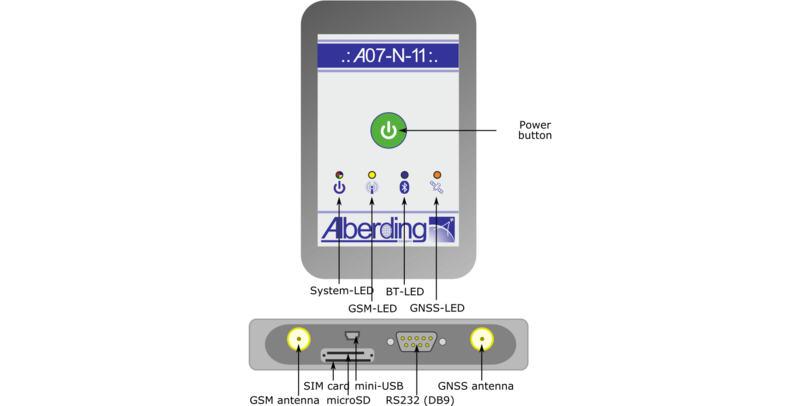 The A07 has the following port on the front panel: GNSS antenna, GSM antenna (optional), mini-USB, SIM card slot and microSD card slot (behind a black cover), as well as a serial port RS232 (optional). The hardware components vary depending on the application. For more details and technical specifications please refer to the datasheet!